The NHS trust which runs Sandwell General Hospital, which has been affected by a recent infection outbreak, is asking visitors to its other hospitals to help prevent further spread of the disease by following some simple hygiene rules. Sandwell and West Birmingham Hospitals NHS Trust, which runs Sandwell General Hospital, closed the site to visitors earlier this month following an outbreak of norovirus. Norovirus causes gastroenteritis, a stomach bug, and is passed from one person to another by contact with an infected person, consuming contaminated food and water or contact with contaminated surfaces or objects. The trust’s other sites, City and Rowley Regis Hospitals, remain unaffected by the bug and are open to patients and visitors. However, trust bosses are asking visitors to these sites to take simple precautions to prevent the virus spreading. A maximum of two visitors is allowed, who should not sit on patients’ beds, and should wash their hands thoroughly with soap and water before and after visiting wards and after using the toilet. In addition, people who have had norovirus-like symptoms, such as diarrhoea or vomiting, should not visit until they have been symptom-free for 72 hours. Staff at the trust are working hard to reopen the affected wards at Sandwell Hospital, and expect these wards to start admitting patients next week (25 February). However, visiting restrictions will remain in place for the time being, so people are asked to check the trust’s website at www.swbh.nhs.uk before visiting. 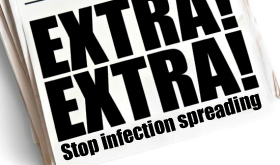 Rachel Overfield, Chief Nurse at Sandwell and West Birmingham Hospitals NHS Trust, said: “Sometimes it is necessary to close wards to visitors to prevent the spread of viruses such as norovirus, which is often found in the community and can spread quickly in hospitals.